Costs come in various forms, but no matter how it's calculated, an idle EHR takes a heavy toll. As hospitals step up adoption of advanced EHR systems and applications that draw from the technology, the cost of unplanned downtime has escalated rapidly, rising an estimated 30% in the past seven years to more than $634 per physician per hour. That's according to Mark Anderson, CEO of AC Group, whose 2011 study placed the average cost of system downtime at $488 an hour per physician. "Originally, users were [primarily] clinical informaticists and nurses. But now that doctors are the ones using EHRs, costs have increased," Anderson says, adding that the original research "looked at hospital costs, but physician salaries were not included because they were not a major factor. … Today, more hospitals are hiring doctors, so now we have to include their offices" in the calculations. The AC Group study looked primarily at software outages and centered on the costs associated with moving to paper processes during downtime and converting back to electronic when systems came back online. "All the work you'd normally do takes four or five times longer when the system is down, so each minute you spend taking care of patients takes four or five minutes doing the same work [during outages]," Anderson says. "We looked at every department, how many people were on the system. It was a time-and-motion study in four hospitals, so it wasn't just theory." Anderson points out that there are other factors, such as hardware, batteries, and generators, that contribute to downtime that the original software-specific study did not take into account. There are also multiple other systems—radiology, laboratory, surveillance, clinical decision support—that interface with the EHR that are also impacted by outages at a far higher rate than five years ago. The end user has also evolved, inflating the bottom-line costs of downtime, Anderson says. "Back then, it was nurses [managing] documentation. Even with CPOE [computerized physician order entry], nurses were doing the entry. Now doctors have to do it," he says. "Also, more patients are being treated in ambulatory settings, so hospitals have a higher acuity level, which requires even more accuracy." Data's influence on health care has risen exponentially over the past decade as demand has grown for real-time access to patient records and encounter-specific clinical decision support at the point of care. This, coupled with broader access by clinical and operations teams, has sent downtime costs skyrocketing—which has, in turn, exacerbated the complexity of calculating those costs. Everbridge, an emergency management communications company that serves a wide range of industries, set out earlier this year to determine the current price of downtime. Its survey found that the average cost per minute was $8,662 across 20 industries, including health care. That includes "productivity losses when clinicians cannot do their jobs as usual because the EHR is not available and the same for productivity of the IT team, and revenue loss incurred by the software," says Vincent Geffray, senior director of IT alerting for Everbridge, who adds that the figure tracks with the $8,900 per minute identified by the Poneman Institute. "The cause for any system to go down can be more complex than just the software or vendor, especially with the digital transformation that means many components must be up and running to make the EHR available to the clinical teams," he says. "There are many causes, like network outages, but what we see a lot of right now is an increased number of cyber attacks in the health care industry. Those systems have to be up and running all the time or patient safety is at risk, so hackers know hospitals will have to pay the ransom or respond to the attack." Eric Chetwynd, Everbridge's general manager of healthcare solutions, notes that the industry's relationship to the EHR has evolved since the advent of the meaningful use incentive program, followed by a plethora of other government-backed initiatives that have driven EHR adoption to its current ubiquitous status. As hospitals become more reliant on EHRs, clinical and operational teams are no longer as familiar with the time-consuming paper-based processes that typically serve as backups when systems are down. "The reliance on the EHR for day-to-day functions makes it more critical and raises the impact of overall downtime on patient outcomes, and also on patient care workflows. All these things make the EHR critical in the hospital setting," Chetwynd says. "They've become so critical that every moment of downtime has an impact on the care and how it's delivered. If I can't record my medications or know what the medication regimen is, if it's down for an hour, I can't give patients medications. Clinicians have a very low tolerance for downtime. The higher the acuity setting, the more important [uptime] is." Peak 10 + ViaWest, which provides data center, networking, managed, and cloud services to multiple industries, offers its customers a gap analysis to help pinpoint the true cost of downtime. According to sales director Joe DeBlasio, the impact of outages is highly individualized and must consider both tangible and intangible costs (see sidebar). It's a complex calculation that takes into consideration an organization's size, patient volume, and connected systems. In terms of intangibles, among the most significant cost drivers are patient wait times and the cost of any adverse events caused by treatment delays. "There was a statistic released recently that indicated 70% of hospitals had one or more patients injured during downtime. That could result in millions of dollars in malpractice [litigation]," DeBlasio says. "Every year more legislation comes down that [makes hospitals] more susceptible to higher fines and costs. Irresponsible EHR management is often enough [to trigger them]. It doesn't even have to be downtime." 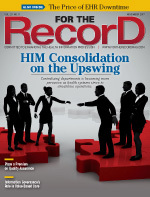 There are ways to lessen the blow of unplanned EHR downtime. The first is to have an effective disaster recovery (DR) and business continuity (BC) plan in place. Like any problem, the first step is recognizing it exists, says Carolyn Byerly, a member of the C-level advisory services team at the HCI Group. She notes that downtime costs fall into several categories, each of which can be addressed in a "well-thought-out, coordinated" DR/BC plan. These include operational, in particular protecting the supply chain, surgery, and other ancillary services. Other areas that require protection are physician productivity, which comes down to protecting access to critical patient data, and costs associated with lost opportunities when downtime results in patients opting to take their needs elsewhere and slow bill time. "There have been a number of studies done over the last five years that show that as we become more of a digital enterprise, organizations are more focused on DR and BC than they were 10 years ago," Byerly says. Once the need for a DR/BC plan has been recognized, assign development roles to the appropriate individuals. The goal should be to identify team members who are certified experts in DR disciplines and able to handle the project's planning aspects. "A lot of health care organizations don't recognize that you can't just hand that role off to anyone. You need someone who knows what's needed in the plan and can ask the right questions," Byerly says. "The second step is identifying the criticality of processes and applications, and the technology environment. What are the priorities in terms of planning for a business recovery? More processes are critical now than they were 20 years ago, so it's an exercise you need to go through with a team of people who can help with the identification and prioritizing." Complicating the process of identifying critical processes and systems is the "burgeoning of the 'Internet of Things' that is going on," Chetwynd says. "Everything from bed alarms to bed management to patient monitoring [is] integrating back to the EHR in some way. If your source of truth is viewed by clinicians and nurses through the EHR world, and that EHR goes offline, it all goes offline. That's something like 13 devices per bed." Achieving the near 100% uptime today's EHR-driven environment demands requires redundancy, which in turn requires a substantial capital investment. For this reason, many organizations turn to service providers that can provide the infrastructure necessary to achieve downtimes of 0.1% and lower. These vendors can provide hospitals with a higher level of protection against financially devastating downtimes. They produce an environment that has already undergone close scrutiny to ensure the highest levels of security and compliance, and have the experts in place to manage those systems to ensure peak operational efficiencies. Even so, vendors cannot guarantee 100% uptime, which is why "there is a lot more contractual language with vendors about the uptime," Chetwynd says. "Five years ago, there might have been a brief amount of language in the contract about doing some maintenance. Now there is language about guaranteeing uptime. From a penalty perspective, because hospitals have the risk, they are demanding more things around 'if it's down for so long there's a financial penalty.' [Hospitals] can get out of the contract in some cases or do a charge back, but today they are more savvy about asking for some kind of penalty. … It's about holding vendors more accountable." Regardless of contractual language, turning over DR/BC to an outsourced service provider does not absolve the hospital of all responsibility. The organization must continue to ensure it has established the proper policies and has a trained team of internal personnel to carry out those policies when downtimes do occur. "As a vendor, we like to say, 'outsource everything to us,' but in reality we need intelligent teams inside, too—actual IT professionals internally," DeBlasio says. "Vendors take on a lot of the risk and provide a lot of the resources … but you need to spell out your business needs and manage [the relationship] yourself." Whether a hospital outsources its DR/BC systems or manages them in house, Anderson says the price is too high not to pay attention to the minutia, down to ensuring batteries are charged, generators are functioning, and disaster plans are up to date and tested. Any weakness could spell disaster—financial and otherwise. "If you lose one piece of data, if you miss an allergy because a system went down for one minute, that could kill someone," he says. "You need to assume the worst, and then you'll be okay." 1. Compute the average annual salary costs (including benefits). 2. Multiply that value by 2.15 (the calculated cost [in dollars]/minute of system unavailability). 3. Divide by 2,080 (average number of hours paid per staff member annually [52 weeks x 40 hours per week]). 4. Determine the number of hours during which the system needs to be available to staff. *Note: Even though operational hours may be 9 AM to 5 PM, users may need access to the system before and after this period. 5. Multiply the value from step 4 by 52 (weeks/year) and again by 1% or the expected percentage of downtime given your server platform. The product of this equation represents the expected hours/year of downtime. 6. Take the value from step 3 (which represents the cost of staff per hour) multiplied by the estimated downtime per year found in step 5. The final value is the estimated cost per year of unplanned EHR downtime.